The other day, we were eating breakfast, and I had given the kids some pistachios. And you know how there’s always a few that don’t have that easy-to-open crack? They are hermetically sealed, and there is no way you are getting in there with just your bare fingers. Usually, we just leave those nuts, and I throw them back in the bag for some reason until all we have left are the uncrackable nuts, and then generally I throw them away. This day, the kids asked RD Husband if he could help them crack the nuts. Friends, do you have a nutcracker? Who has a nutcracker these days? Honestly, the last time I saw a nutcracker IRL was at my grandparents’ house, decades ago, where they always had that bowl of nuts on the living room table that had actual walnuts like in the shell, and therefore you needed a nutcracker to access them. Do people buy those kind of nuts anymore? Honestly, I have no idea. So we laughed for a while at the whole nutcracker issue, and then I had a brainstorm. And this is where this post turns into more than just the best story you’ve heard in the last 5 minutes and becomes an actual tip. 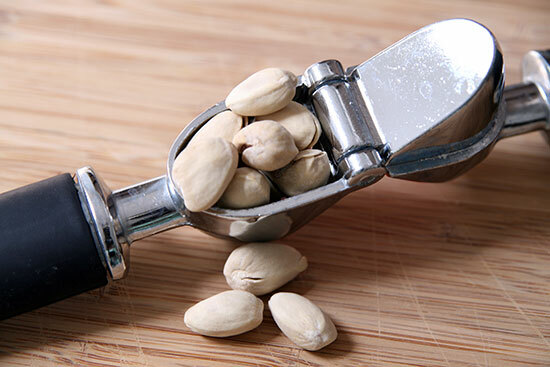 Because, facts are facts, and we still had those pesky pistachios and no nutcracker. 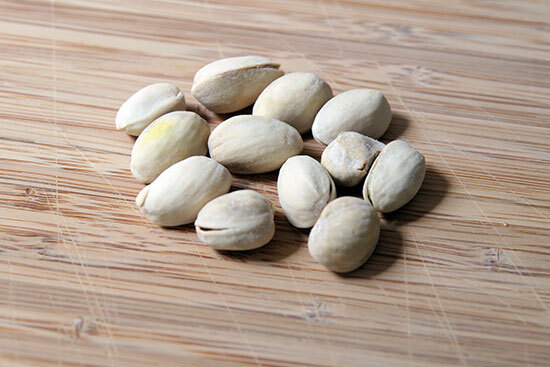 You, too, may find yourself in a bind with some sealed pistachios and nothing with which to crack them. Know what you do? Pull out the garlic press. That’s what I did. At first, I was going to pound them with the rolling pin, but I realized that wasn’t really the most delicate solution. So I got out the garlic press, stuck a nut inside, and gently, gently squeezed until I heard a distinct crack. Lo and behold, that nut was cracked, both literally and figuratively. You can thank me later when you have a plateful of delicious pistachios meats and not a shell to be found. That’s a great idea! I usually use my teeth, which isn’t a good solution for obvious reasons. We had nutcrackers growing up that were dusted off for Christmas and put out with a big bowl of nuts, but they’ve been MIA in my own life.